WHO'S YOU FAVOURITE DISNEY OR STORYBOOK CHARACTER? PRICES ARE FIRM AND VARY AS TO RARITY OF ITEM. DISCOUNT GIVEN FOR MULTIPLE PURCHASES. WOLF & 3 PIGS (4)2 $25 EACH, ALICE IN WONDERLAND SET (6) ALICE & RABBIT 25 EACH, Only Alice left. 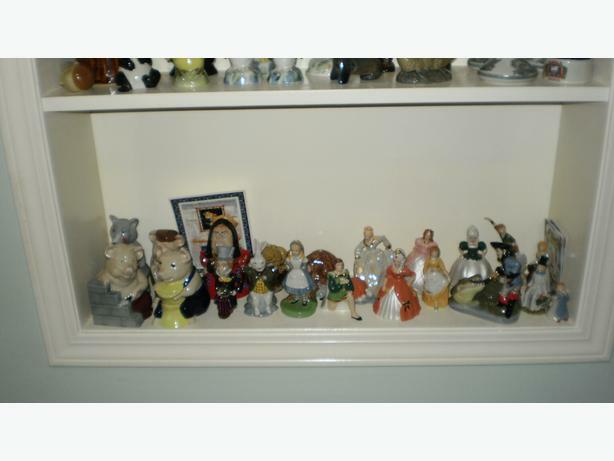 DORMOUSE, CAT & MAD HATTER $40 EACH, QUEEN $55, CINDERELLA SET (6) $25 EACH, PETER PAN SET (6) PETER, JOHN, WENDY, MICHAEL & TINKERBELL $30 EACH, CAP'T HOOK $60.